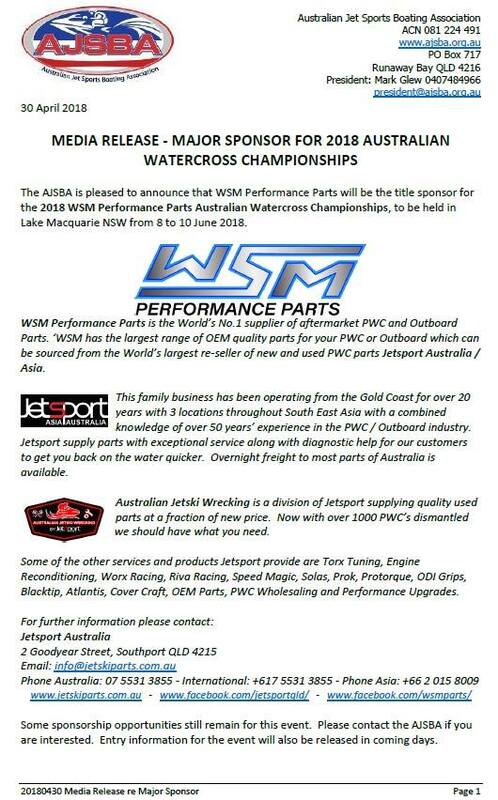 The AJSBA is pleased to announce that WSM Performance Parts will be the title sponsor for the 2018 WSM Performance Parts Australian Watercross Championships, to be held in Lake Macquarie NSW from 8 to 10 June 2018. WSM Performance Parts is the World’s No.1 supplier of aftermarket PWC and Outboard Parts. ‘WSM has the largest range of OEM quality parts for your PWC or Outboard which can be sourced from the World’s largest re-seller of new and used PWC parts Jetsport Australia / Asia. This family business has been operating from the Gold Coast for over 20 years with 3 locations throughout South East Asia with a combined knowledge of over 50 years’ experience in the PWC / Outboard industry. Jetsport supply parts with exceptional service along with diagnostic help for our customers to get you back on the water quicker. Overnight freight to most parts of Australia is available. Australian Jetski Wrecking is a division of Jetsport supplying quality used parts at a fraction of new price. Now with over 1000 PWC’s dismantled we should have what you need. Some of the other services and products Jetsport provide are Torx Tuning, Engine Reconditioning, Worx Racing, Riva Racing, Speed Magic, Solas, Prok, Protorque, ODI Grips, Blacktip, Atlantis, Cover Craft, OEM Parts, PWC Wholesaling and Performance Upgrades. Some sponsorship opportunities still remain for this event. Please contact the AJSBA if you are interested. Entry information for the event will also be released in coming days.